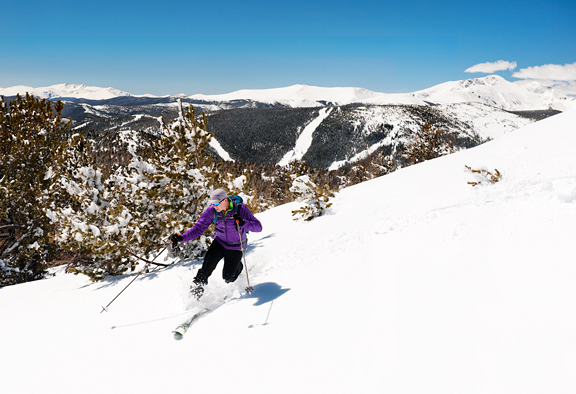 The last ski resort for which we had access to has closed for the season here in Colorado. But the season isn’t done. At least not today it isn’t. It snowed at our house (along with rain, graupel, sleet, and sunshine) and I’m pretty sure the clouds dropped a few quick inches in the high country. 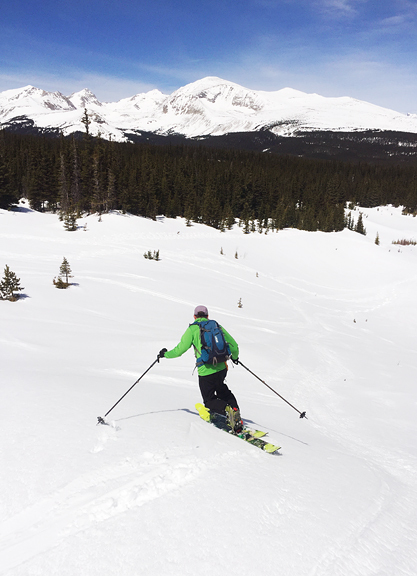 From now until the start of the 2016-2017 ski season, it’s only backcountry skiing for us (skinning uphill and skiing down). Actually, we’ve been doing that exclusively since early April. Here’s what May looked like in our backyard last week. 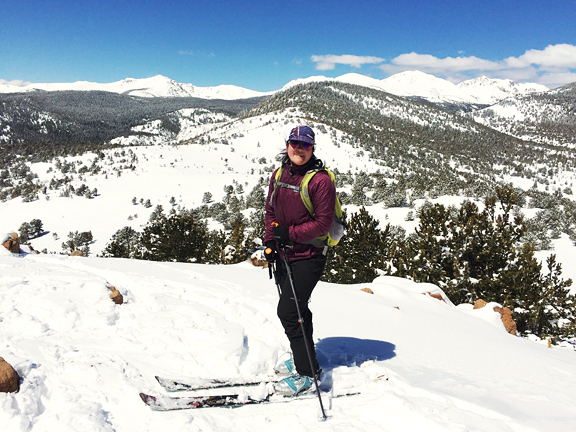 Daytime temperatures soared well above freezing and the snow didn’t freeze overnight at higher elevations. 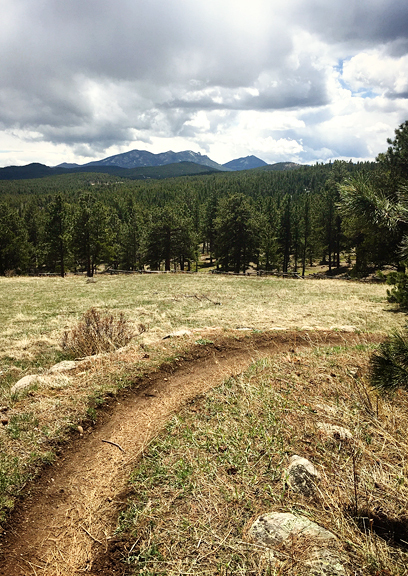 Days like these leave us choosing between running wet, muddy, and patchy trails or skiing slop. We chose both. 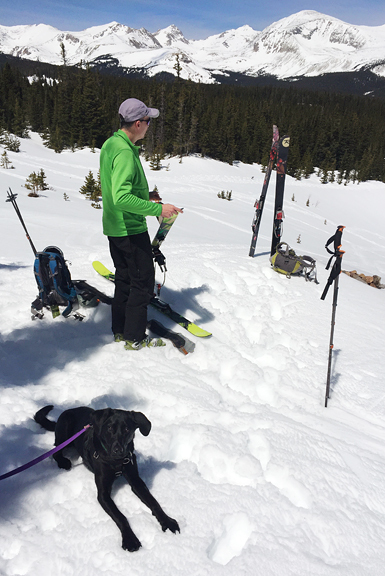 On our last ski tour, Neva was off leash the whole way down to the trailhead and she was incredibly good. She didn’t run off, she didn’t cross in front of our skis, and she always kept an eye on where Jeremy was (I bring up the rear in case little pup decides to run off). Jeremy took Neva on her first trail run last week, too. We’ve been slowly gauging how she takes to running on trails by running her for short distances (like 50-200 feet at a time) while we walk or hike. When she was a wee puppy, Neva would jump on your legs and try to bite your pants if you started running. That was (thankfully) short-lived. She did exceptionally well on her first real trail run (a short 5k) – cuing off of Jeremy’s pace, keeping a good distance so no one tripped, and responding to voice commands. 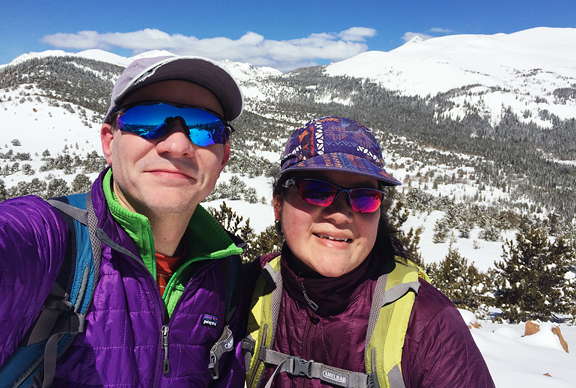 So while Neva works up to longer distances, Jeremy and I are both concentrating on uphill climbs – because the prettiest runs are up high in the mountains and we want to be ready when they melt out. I regard this time of year as the uphill slog when days get longer and hotter. I don’t consider us to be over the hump until late July even though the summer solstice is in late June (it has to do with the thermal latency of the atmosphere – the same applies in winter). 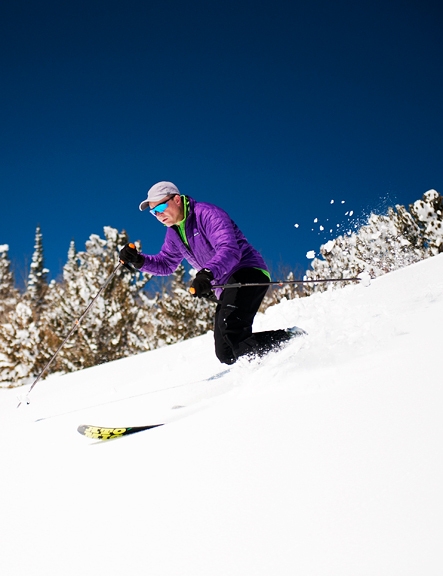 But there is plenty of good adventuring to be had in summer to tide us over until we can glide on snow once again. Some of that adventuring will involve finding porcini and chanterelles in the forests. An easy meal preparation involving the mushrooms we forage is to sauté the mushrooms in butter and garlic, add white wine and cream, and serve it over pasta. 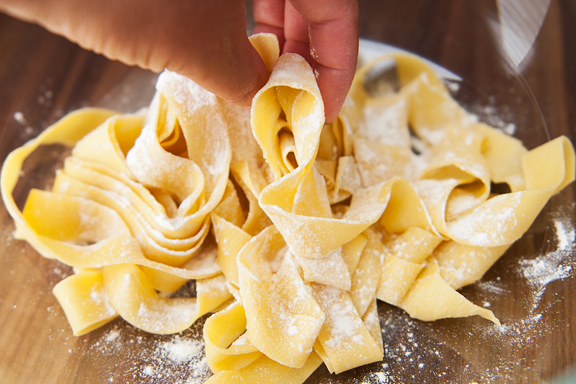 My favorite pasta is pappardelle – wide elegant ribbons of pasta that hold sauces well and wrap around other ingredients. Unfortunately, I can’t buy pappardelle in our little town and I really try to limit my trips to Boulder to once a week. 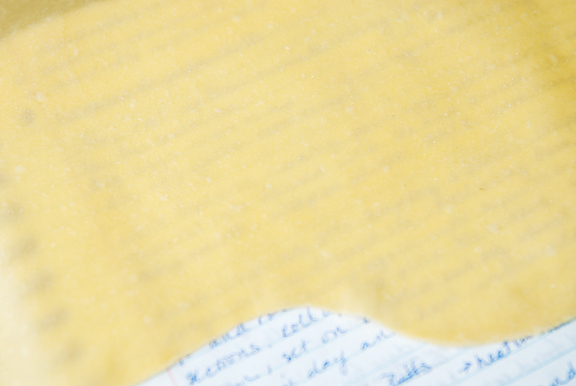 Mountain folk tend to be self-sufficient types and it occurred to me last summer that I knew how to make my own pasta for lasagne, so how different could it be from making my own pappardelle? I have never owned a pasta machine and while the thought of getting the attachment for my stand mixer or even the hand-crank machine is tempting, I don’t make pasta often enough to justify yet another kitchen gadget. 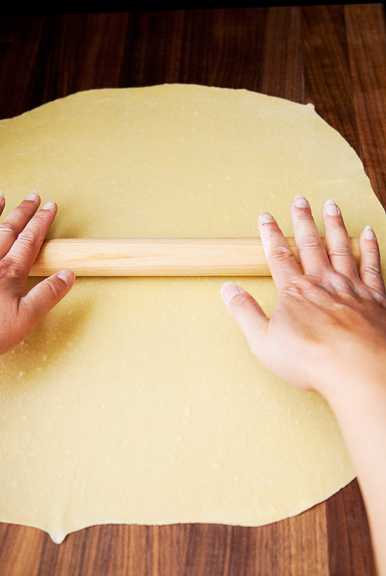 No, I actually enjoy rolling pasta out by hand. It’s one of those things that allows you to think and get your frustrations out simultaneously – like trail running, but much tastier. 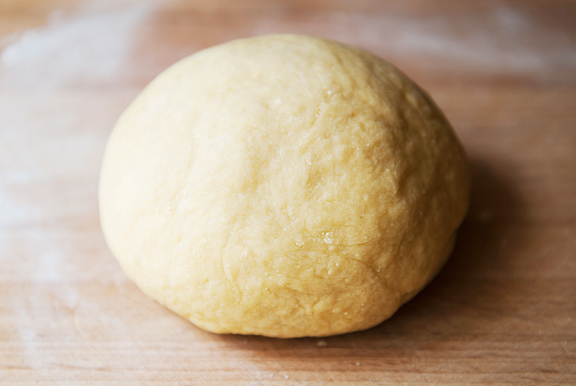 After a couple of times, you start to get a feel for the dough and its consistency, its thickness, its character. 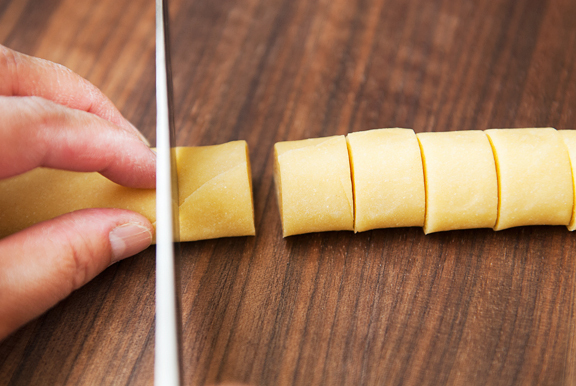 If you don’t want to roll your pasta out by hand, that’s totally okay! You can put this dough through your pasta machine (start on the thickest setting and then gradually work down to almost thinnest) and probably achieve more consistent results. I do think it’s worth trying by hand at least once. You might even enjoy it. When rolling the dough, roll away from you, then turn the dough 90 degrees, roll away from you, turn the dough 90 degrees, and repeat until the dough is thin. By thin, I’ve heard that it should be thin enough to read print through it. At this point, you can cut the pasta wide for pappardelle (about 3/4 inch wide) or less wide for tagliatelle (3/8 inch to 1/2 inch wide). You can also go thinner than these, but I’m working with the fat noodles here. 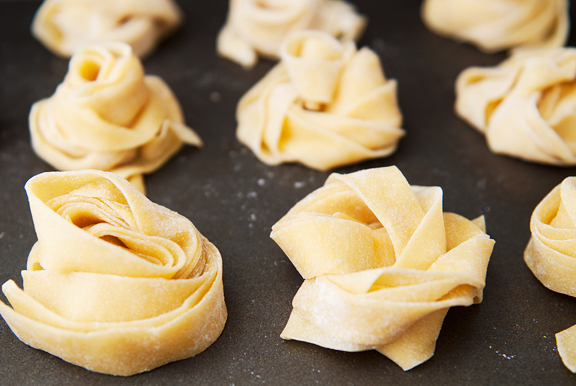 Unravel each noodle and toss them in batches in some flour to keep them from sticking together. You can make the pasta early in the day and let them dry out before cooking the same day, or cook them right away. If you do set them out to dry, don’t bunch them together or they might stick and ruin all of your hard work. 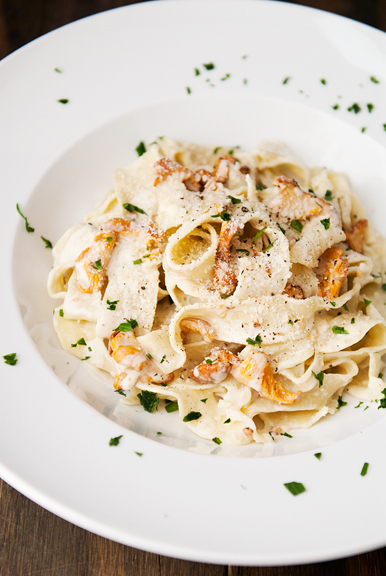 The fresh pasta will take anywhere from 1-3 minutes to cook in a pot of boiling salted water, so be vigilant! 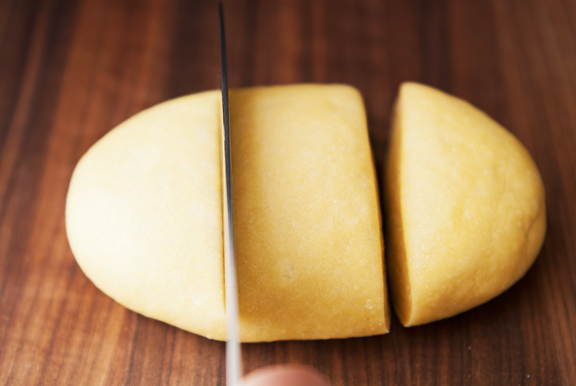 Fresh pasta has a delicate flavor and bite. 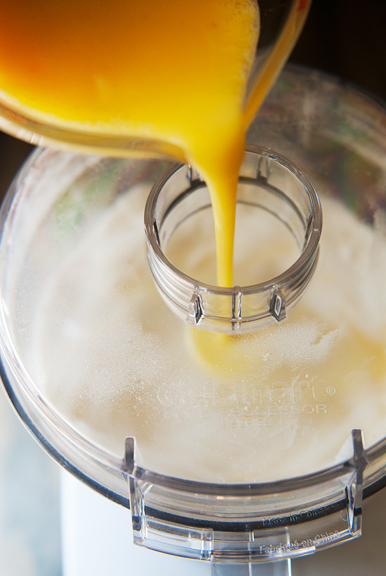 It is well suited for equally delicate sauces made with a cream or butter base as opposed to heavy meat-based sauces (use your dried pasta for that). The one exception I’ve read about and completely agree with is bolognese sauce, which is SUPERB with handmade fresh pappardelle. That said, handmade fresh pappardelle with freshly foraged chanterelles in cream sauce is nothing to sneer at. 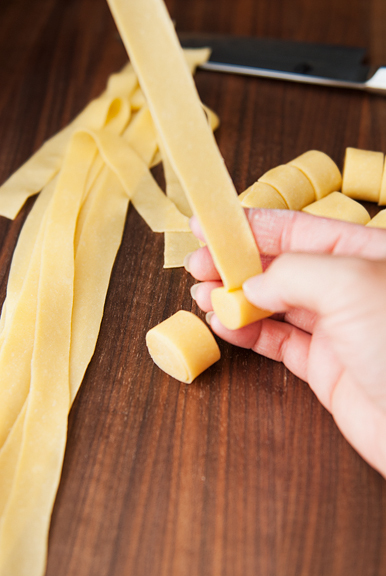 Fresh pasta is definitely worth making at least once if not always. 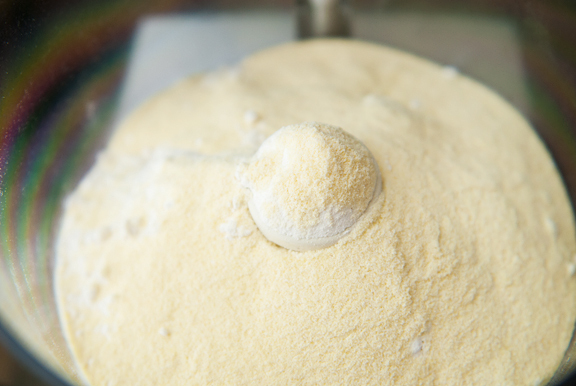 Place the flour and semolina in the bowl of a food processor and pulse several times until mixed. 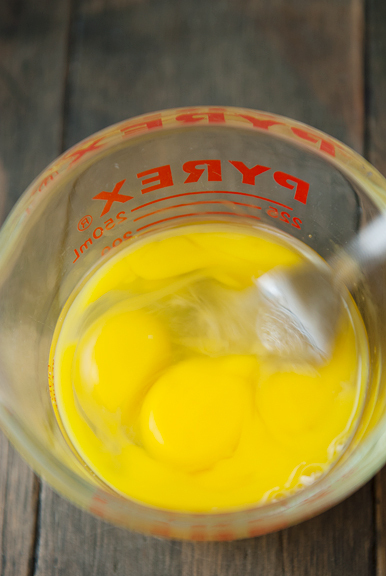 Beat the eggs and egg yolks together in a measuring cup. 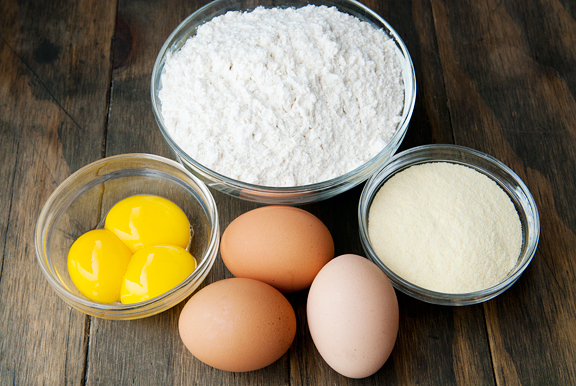 While the food processor is running, pour the egg mixture into the flour. When the dough is moistened, turn it out onto a lightly floured work surface and knead it for 3 minutes or until the texture is silky smooth. 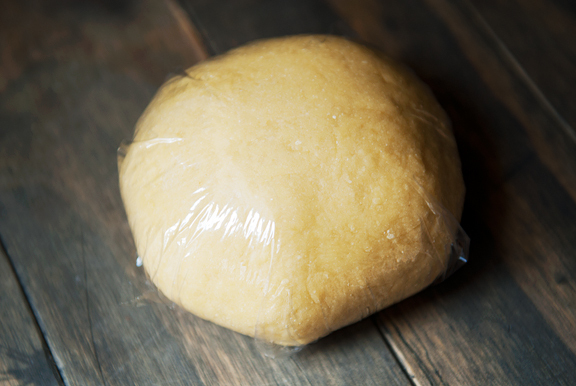 Wrap the dough ball in plastic and let it rest at room temperature for a half hour. Unwrap the dough and cut it into thirds. Wrap two of the pieces in the plastic. Roll the third piece out on your floured surface, rolling AWAY from you. 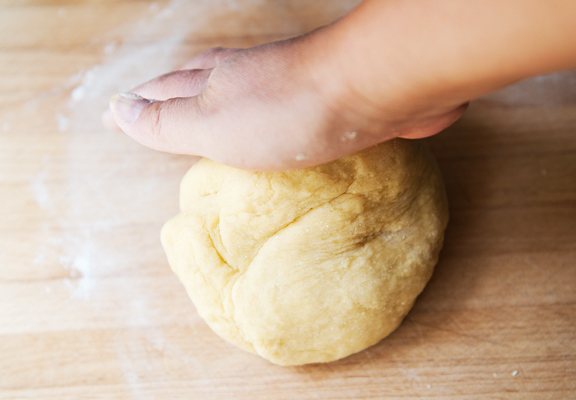 Turn the dough 90 degrees and roll away from yourself again. Continue until the dough is super thin (if you lay it over newspaper or a magazine, you should be able to read or at least see the text through the pasta). 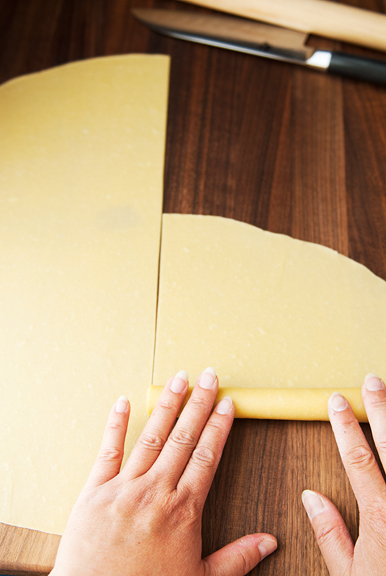 Cut the sheet of dough into 12-inch sections. Roll each section up and slice into 3/4-inch wide strips. Unroll the pasta, toss the strips with flour, and set them on a dusted baking sheet. Continue with the remaining dough. You can make the pasta ahead of time and leave it uncovered at room temperature. Toss the pasta from time to time to encourage drying and to prevent clumping or sticking. Makes 1 pound of fresh pasta. To cook, bring 6 quarts of salted water to a boil. Boil the pasta for 1-3 minutes (test for doneness). Drain and serve. The chef at my work just taught me how to make pappardelle the other day!! It was so fun and fairly simple. Thanks for sharing! pasta is so easy and fast to make, and then i dunno, it never happens. 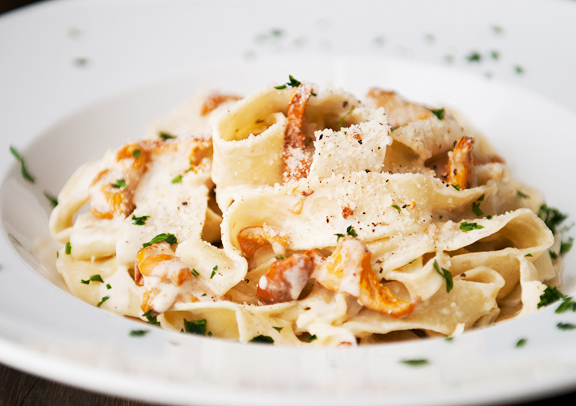 but my goodness, i might have to with the idea of chanterelle, garlic and cream sauce implanted in my head. I make pasta often with my fresh eggs and pasta attachment, but I love pappardelle which I haven’t tried. I never thought about rolling the dough up and then cutting it. I’ve always used a pizza cutter. This is now on the menu this week. I’ll have to adjust the type of mushrooms though;I live in the desert, not the mountains! P.S. I received The Food Lab book yesterday for Mother’s Day. After trying your pork chop recipe that you shared from the book, I looked at it and thought it would be a good one to have. I enjoy the chemistry of cooking/baking! Can’t wait for the chanterelles to be back in season here in PA! I just hand rolled some pasta the other weekend myself…I used Cook’s Illustrated Wild mushroom ravioli recipe and they were delicious. Rolling it out by hand was part of the fun! Pappardelle really is excellent with bolognese. I find that it helps to let the pasta sit out and dry a little before using it with heavier sauces. A local chef also suggested that I store the rolled pasta in the refrigerator overnight to let the texture set (still need to try that). 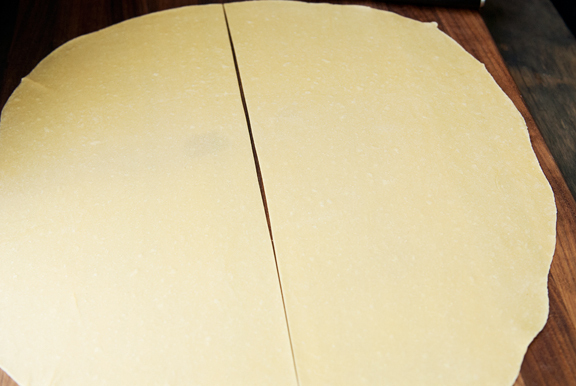 You’ve inspired me to roll the pasta by hand next time – thanks for the recipe! That looks so incredibly delicious. I have tried by hand, but couldn’t get it thin enough. Maybe because I didn’t use semolina. It’s hard to find the types of fresh pasta I want, so I think I will have to give this a go. Thanks! So THAT’S what the flour part is supposed to look like. My grandmother’s noodle recipe says something like that, but I could never figure it out in a way that didn’t involve a gummy mess when cooking. I usually use my pasta attachment and slice it on that as well, then hang it to airdry. Jill – oh, there isn’t enough time! That’s why I’ve scaled back my posting schedule so I can keep sane! Leeann – I hope the pasta worked out for you! And even I can’t serve the pasta with fresh chanterelles right now because they won’t be coming up until July – so I think any mushrooms you can get your hands on (that are safe and edible) will be great! So glad you like The Food Lab cookbook! Isn’t it awesome?! Christine – mmmm, ravioli is on my project list someday! Cynthia – I’ve never done that before, but it sounds like a nice tip! Does the pasta stick to itself when rolled up overnight though? Good luck and I hope it works out! Kristin – you’re welcome! And I’m not sure if semolina makes a difference in how thin you can roll it or not. Another handmade lasagne recipe doesn’t use semolina and I was able to roll that one pretty thin, too. I admire your cooking skills and have been following your site for a long time. Could you please share the Chinese egg noodle recipe if you have one? The kind of noodle that we use in Wonton noodle soup. Thank you so much! Well, I’ve started lifting weights since I last tried it, so maybe more arm strength will help!! Nhat-Tieu O’Brien – I don’t have one, but I’m guessing it’s a pretty straightforward recipe. Try googling and getting a recipe from a trusted source?